By default, the Timeline view will display every layer in your scene. You can choose to hide non-drawing layer types such as effects, groups and sounds from the Timeline view to de-clutter the list of layers and make it easier to select drawing or peg layers when doing cut-out animation. In the top-left corner of the Timeline view, click on the Menu button and select View > Show > Show Manager. Make sure the layer types you want to display are checked, and that the ones you want to hide are unchecked. 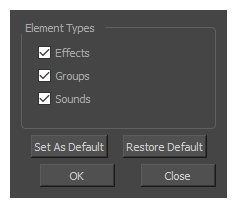 If you want these settings to persist after you close and reopen Harmony, click on Set as Default. The unchecked layer types will now be hidden in the Timeline view.